Last week OpenStax, the Rice University-based publisher of open educational resource (OER) materials, announced that according to their data more than 2.2 million students at 48% of colleges in the US and 1,150 outside the US are using OpenStax free textbooks, saving an estimated $177 million. This is compelling data in its own right, and we are working on analysis around this organization and its model, but somewhat buried in the press release is another significant statement around what students currently spend on textbooks and what savings are possible with OER. As a result of the unprecedented downward shift in textbook prices, OpenStax will be decreasing its estimated student savings figure from $98.57 to $79.37 based on federal data. 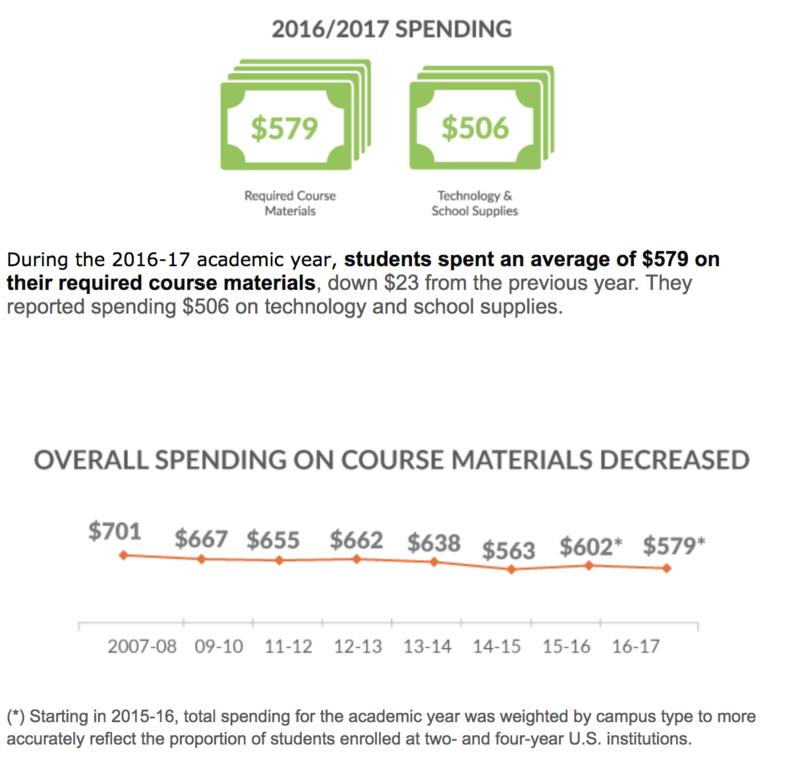 The U.S. Department of Education’s National Center for Education Statistics published a study in May stating the average undergraduate student spent $555.60 on required course materials for the academic year. Dividing that number by seven courses (the undergraduate average, according to enrollment data) comes out to $79.37 in savings for each student using an OpenStax book. I have long argued that OER groups and others arguing for making college more affordable should use baseline numbers based on what students actually pay for textbooks, rather than the all-too-common $1,220 - $1,420 per year numbers from a misuse of College Board budget numbers (see chart at top of page 10 in this document). With OpenStax moving to new federal data showing $556 average expenditures, we should start to see more reliable estimates of student savings. Kudos to them. However, this level of student spending should not be a surprise to anyone following the curricular materials market. What OpenStax refers to, however, is the new National Postsecondary Student Aid Study (NPSAS) restricted-use data from the US Department of Education's National Center on Education Statistics, showing $555.60 average student expenditures per year. Which is right in line with the NACS data. We plan to explore the NPSAS data in more detail, as it provides rich data for crosstabs and exploration of student expenses. But for now, kudos to OpenStax for this change in student savings estimates, even if it is years overdue. I would hope that other OER advocates would follow their lead. I’ve been a fan of the OER movement for some time and particularly OpenStax, but, perhaps since my own kids went to college, I’ve become less convinced of the importance of OER. I’m in Europe for for each of my kids the costs per year are approximately: Accommodation $9,000, Living expenses $6,000, Fees $3,000 ($7,000 subsidy by the state), Books $500. Textbooks costs are not the problem. We should treat all of these numbers as estimates. At the Northeast OER Summit, Nicole Allen of SPARC suggested taking the cost of the original textbook and dividing in two. Doing so takes into account the secondary market, the opportunity for students to sell back their books, physical book rentals, ebook rentals, ebooks… David Wiley likes to remind people that there is often a cost of OER, that some students choose to print out the book, get a bound copy. With all that in mind, OpenStax is trying to come up with an easy number they can quickly multiply times adoptions. It is worth noting that OpenStax specifically targeted high cost general enrollment courses. Cambell Biology is selling for $182 dollars on Amazon right now. Using SPARC’s 50% rule, saying that they saved students $90 wouldn’t seem inappropriate. Most books in their catalog are aimed at courses where the book cost was far above the average (whether the true average is $100 or $80). When I asked the question during her Q&A session, Allen’s advice was to have a methodology that’s simple enough to calculate and that you can defend. I won’t nitpick OpenStax’ methodology, they are leading. Isn’t the source data mentioned from 2015-2016? I understand it could take awhile to pull together the data, but I have a hard time trusting old data. KB – No. A simple reading of the post will explain the ongoing data collection by NACS and the brand new ED data. Edward, “We should treat all of these numbers as estimates”. Or, we could acknowledge that in terms of what students actually pay, we have fairly hard data that has been consistent for a decade. Arbitrary heuristics like picking 1/2 of list price is not close to having the same basis in supporting data as what NACS and ED are showing. if you want to take into account the secondary market / resale / rental / etc, we have real data. SPARC should do what OpenStax is doing, and start with the best data we have. It is true that OpenStax takes the average and then comes up with simple metric (divide by 7, regardless of course type) – which is too simple IMO. You make an excellent point about OS’s targeted courses – In our follow-up post, I’ll try to tease out how the ED numbers (NPSAS) might indicate different expenditures in the courses targeted by OpenStax. I still think OpenStax does a great job. They are a good solution for students counting each penny. I’m curious; what else might be included in that figure? It says course materials costs, could that be lab fees and software too? I didn’t spend much money on textbooks, but I did end up having to pay for subscription tools like clickers and quiz apps or other submission systems. Not that textbooks aren’t a huge cost, but I’m interested in seeing how this number fluctuates as more courses adopt tools that ask students to pay fees. Required subscriptions also aren’t returnable / rentable / sharable in the way that textbooks are. The price of individual textbooks varies greatly, depending on subject matter and many other factors. For college stores, any book or other media that is required or recommended for class is a “textbook*.” This is a much broader definition than is used by publishers and the general public. And it is a significant factor in the average price reported from Financial Survey data. Textbooks for college stores will include many books and materials that were not published as textbooks. Note they track “supplies and technology” as a separate category. You are right that the situation is getting messy and not just an issue of textbooks, per se. To the course materials implies course content and not pure supplies or technology. Clickers and pure submission apps are not content but quiz apps are (to the best of my knowledge). Hope that doesn’t confuse matters more. Top Hat Marketplace: What is it and should we care? Before We Turn Over Curriculum To Apple And Amazon . . .
Cengage Unlimited – Marketing ploy or significant change in strategy?